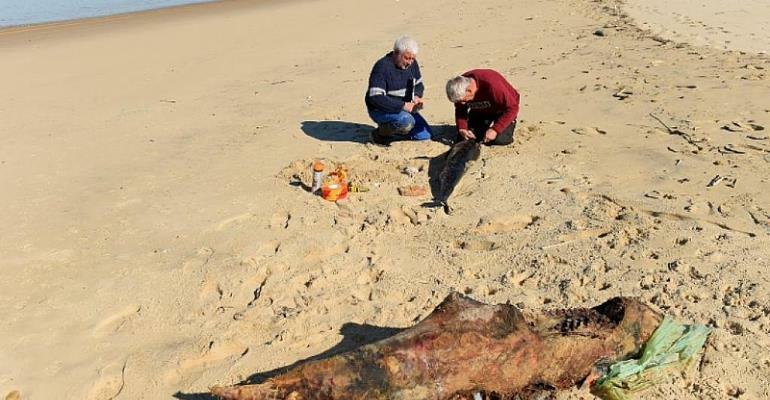 The mutilated remains of more than 1,100 dolphins have washed up on the shores of France's Atlantic beaches since January. The record number of mass deaths has alarmed animal welfare groups around the world – who say France isn't doing enough to protect the mammals. It's unclear why so many dolphins have perished this year, and why their injuries are so severe, although Willy Daubin, of La Rochelle University's National Center for Scientific Research, told the media these types of fatalities are usually the result of dolphins being caught in industrial fishing nets. "There's never been a number this high... In just three months we have beaten last year's record – which was up from 2017 – and even that was the highest in 40 years," Daubin says. It's also reportedly common for fishermen to cut body parts off dolphins who have suffocated while trapped in fishing nets to avoid further damaging the nets. French Ecology Minister Francois de Rugy has launched a national campaign to protect the creatures – including more research into acoustic repellent devices that send unpleasant signals to dolphins. The devices, however, have been called useless by rights groups.